The cardinal fish is a fish with an orange, round body. Normally it has two or three black spots at the base of the tail. Its eyes are very large, black and with two horizontal bands of the same colour. The mouth is turned upwards and has small, very fine teeth. Its fins are transparent with a slight red tone. Its maximum size is 15 cm. It may be found alone or forming small groups in caves or cracks, where it remains still in the entrance, suspended in the water. It is a carnivorous fish that feeds on small fish and invertebrates. Its reproduction is oviparous. 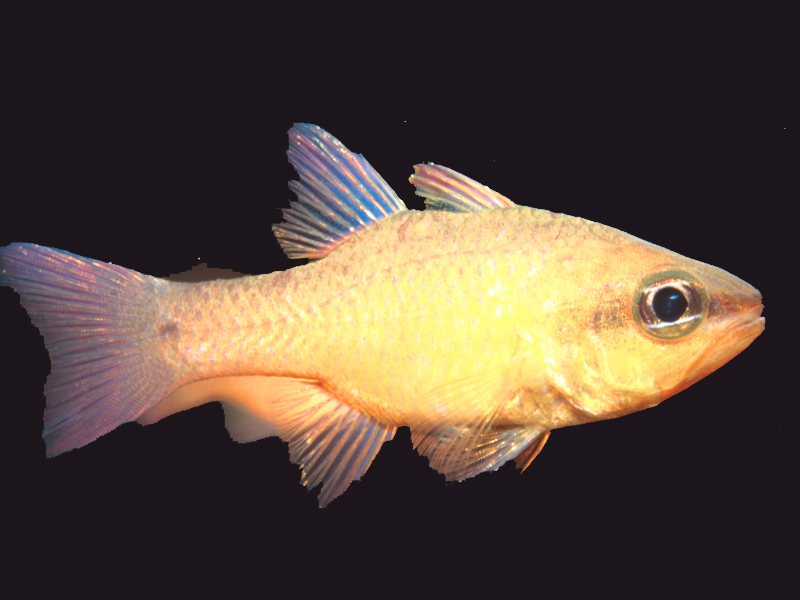 It lays its eggs from June to September, and fertilisation is internal, the coupling being accompanied by palpitating movements (a sightly nuptial dance) performed with the partner’s fins. There are normally 3 or 4 females for each male and the spawning comprises some 20,000 eggs. In winter it occupies muddy beds from 100 to 250 m, but during the summer it approaches the coast and hide in rocky corners above 50 m, where it lives in small groups. It also inhabits the semi-dark areas of shallow caves. It is found in the eastern Atlantic, from Morocco to the gulf of Guinea, and in the Mediterranean. The male keeps the eggs in its mouth until they hatch (after 8 days), when they are expelled, during which time the male does not feed. The advantage of incubating the eggs in the mouth is that they are protected in their development from all possible enemies, which allows them to hatch intact. This process may be repeated up to 4 times a year, which may cause the male to die of starvation.